Historic White Pine Village, Ludington, Mich. Historic White Pine Village offers a living-history, fun-filled tour of a late 19th–early 20th century pioneer village. The village boasts 30 historic exhibit buildings, including the original Mason County Courthouse (on the State Register of Historic Places) built in 1849 by Burr Caswell, the territory’s first permanent pioneer. It was the first frame house in Mason County. Burr Caswell, his wife Hannah, and their four children lived in this house. The family moved upstairs turning the main floor into a courtroom and trading post, and in the basement was the first jail. In 1861, when the location of the seat of government was moved to Lincoln Village (now north of Ludington), it reverted to a single-family residence. The village is filled with authentic turn-of-the-century artifacts, including a steam locomotive, tender car and flat car loaded with logs and headed toward the village’s sawmill. Visitors come face-to-face with early settlers, who are first-person interpreters with scripts carefully prepared by staff and historians. 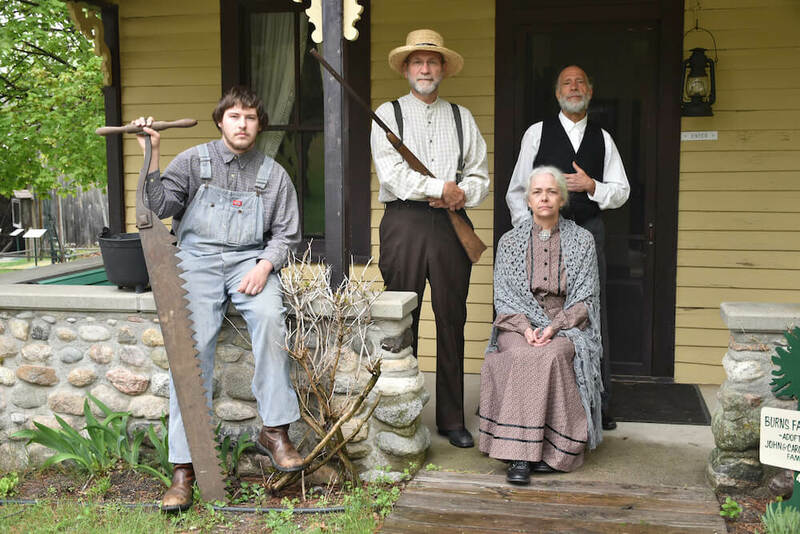 They interact and improvise with visitors in the persona of historical characters and recreate actual personages from Mason County. Come enjoy a stroll through time on the quaint village grounds, filled with time-period flower gardens, mulberry trees and the pure fresh air of Lake Michigan.